As part of our Holy Week observance we celebrate the First Holy Communion for our youth. This year we have one youth who will begin participating in this wonderful Sacrament of the Church. He has participated in First Holy Communion classes during Lent this year. This included Bible Study, discussions, a “field trip” to the Sacristy (the room where the communion is prepared, and the communion vessels are stored), decorating a chalice for receiving his First Communion, videos and bread making. 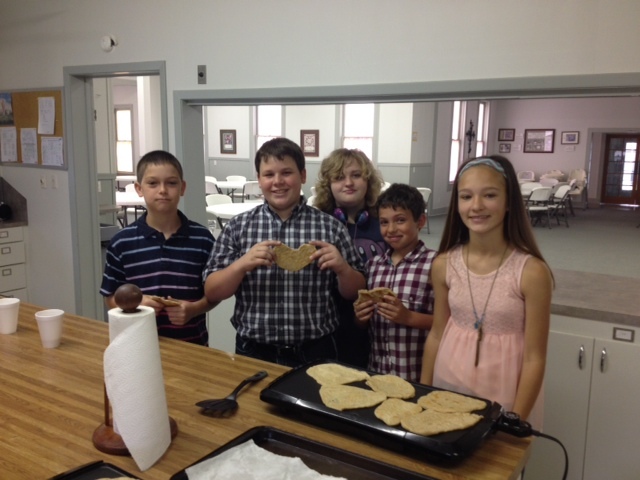 The Junior High Sunday School class helped the student with the bread making. Much of the bread used for Holy Communion at MLLC is made by our youth, as well as other church members. Above is a photo of the students and their teacher preparing the bread on Palm Sunday 2014. This recipe makes a flat bread, and it is cooked almost like a pancake. Thank you Esther for teaching our youth how to make this bread for this special day. Very tasty and important ministry. Here are the youth and the First Holy Communion student after they have sampled the finished product. Our candidate for First Holy Communion is in the red/white plaid shirt, 2nd from the right. As part of worship on this Maundy Thursday the student will also receive a Bible from the congregation. This he will use for personal reading, Sunday School, Confirmation Class, and the like. We partner with parents in helping them to fulfill the vows they made at their children’s baptism. There is a line in the liturgy of Holy Baptism which reads, “place in their hands the holy scriptures…” At the Maundy Thursday service a Bible will be given to the parent, and then that Bible will be placed in the hands of the student. It is a loving ritual form of fulfilling this promise. Here is a photo of the Bible, next to the Baptismal Font, and with our Holy Communion banner in the background. Click here to read more about First Holy Communion at MLLC. Click here to see our Holy Week Schedule for 2014.